Promotes, supports and expands cultural activities in the county and to help integrate them into the lives of all residents. Includes grant information, membership, calendar and cultural plan. Dedicated to bringing together artists, the public, and businesses for a greater understanding, appreciation, and promotion of the arts and the development of a strong and vital downtown Phoenix arts community. Established in 1981 as a tax-exempt, private public benefit corporation which serves as the local arts planning and programming agency for Plumas County. Nonprofit charitable organization of cultural groups, Calgarys two school boards and the general public, which promotes the arts in education. Community arts organization that provides technical assistance, artistic and organizational development activities, and grants to artists and agencies. Works to employ artists, put artists in public schools, and addresses local arts needs. A research-based company that works with organizations, foundations, regional, state and local arts agencies, and state and local governments to build audiences and public involvement in the arts. A not-for-profit public institution focused on promoting cultural communication between Europe and the USA. Information on programs for schools, the public and summer art camp. Placement agency for advertising, graphic arts, interactive, marketing, printing and public relations professionals. Connecticut-based placement agency for advertising, graphic arts, interactive, marketing, printing and public relations professionals. online publication for the arts featuring poetry, prose and photography. considers submissions from the general public year-round. message board, public archives, live chat, and links to various arts and humanities sites. Information on board and staff, The Art Bank, grants, services, fellowships and Art in Public Places program. Combines ESL with classes in the performing arts, theatre, media, film, speech-training, and public speaking courses. public gallery and classes in the sogetsu style taught by kiku shibata. includes news, articles, course and demonstration schedules and image galleries. based in san jose, california. public gallery and classes in the sogetsu style of ikebana taught by kiku shibata. includes news, articles, course and demonstration schedules and image galleries. Description of courses offered and profiles of the staff. News of events, alumni achievements and previous productions. Based in Livonia, Michigan. a community gallery owned by visual arts brampton, offering free exhibit space to the public. an association of professional sculptors providing a single source for buying, commissioning and consulting services of fine arts and public sculpture. If the business hours of Arts and Humanities Council of Montgomery County in may vary on holidays like Valentine’s Day, Washington’s Birthday, St. Patrick’s Day, Easter, Easter eve and Mother’s day. We display standard opening hours and price ranges in our profile site. We recommend to check out creativemoco.com/ for further information. 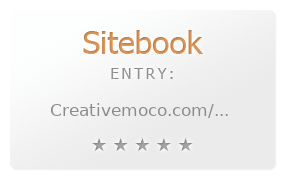 You can also search for Alternatives for creativemoco.com/ on our Review Site Sitebook.org All trademarks are the property of their respective owners. If we should delete this entry, please send us a short E-Mail.